An infernal portal device channels energy from its captive, opening a rift in the planes. Hell Raised, a 5-player dungeon intended to take 15-45 minutes to complete, featuring 6 challenging, scripted encounters. Hell Raised was the first dungeon assigned to me, and the work that taught me familiarity with Funcom’s suite of tools. I joined the team as a Junior Designer, with only a few university semesters of programming and a lifetime of pen-and-paper roleplaying games behind me. Within 8 months, thanks to the support and training from my team, I had delivered a working prototype for the entire dungeon and dropped my Junior title, demonstrating skill at scripting, NPC creation, spell creation, and encounter design. Hell Raised would go on to be featured in an exclusive for PC Gamer Magazine, and stood as proof of the direction the team wanted to take group dungeons in The Secret World. 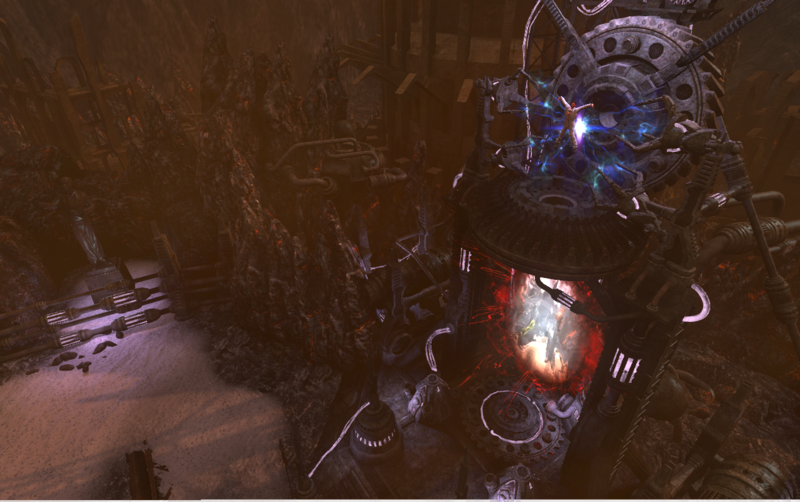 During development, the dungeon team solidified its vision of what The Secret World’s dungeons should look like. In Hell Raised, an army of demons have captured a human magus. Using his magic, they’ve cobbled together ancient and terrible machines to siphon energy to a massive portal generator for an attack on Earth. Players discover this as they move through the environment, first encountering wicked electrical capacitors, then geothermal power sources, pipelines humming with raw power, and, finally, the massive portal itself. Vile hellspawn guard the mechanisms at every step, with defenses centering on the players’ ultimate goal. Hell Raised features a few instructional trash encounters, 3 miniboss encounters, and 3 boss encounters. For a detailed look at the design of a few of the more exciting fights in Hell Raised, read on. The Antimony Ministrix prepares to fire a chain lightning blast. In the background, infernal devices crackle with withering energies. A wicked succubus guards a ring of infernal machines; pipes lead off into the distance, ferrying power towards some distant contraption. Our minibosses were intended to use simple NPCs in hazardous areas. This design evolved from a field of machines, activating at random, to a ring of machines pushing the players around the central pillar of the arena. The pattern based behavior allowed players to anticipate the hazard and demonstrate mastery by responding quickly. 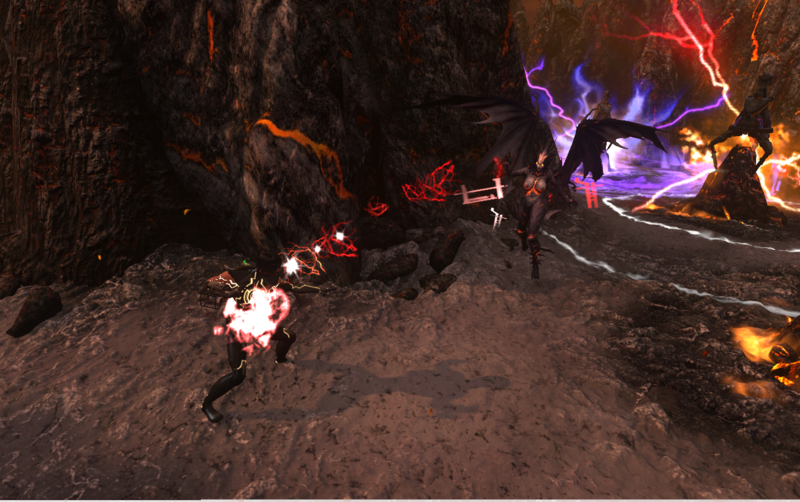 The Antimony Ministrix herself fights at range and occasionally blasts the group with a bolt of chain lightning, bouncing between players who are standing too close together. The machines return in a later miniboss encounter, and Recursia, Many-In-One, uses the same chain lightning spell, though the circumstances make it more punishing later on. 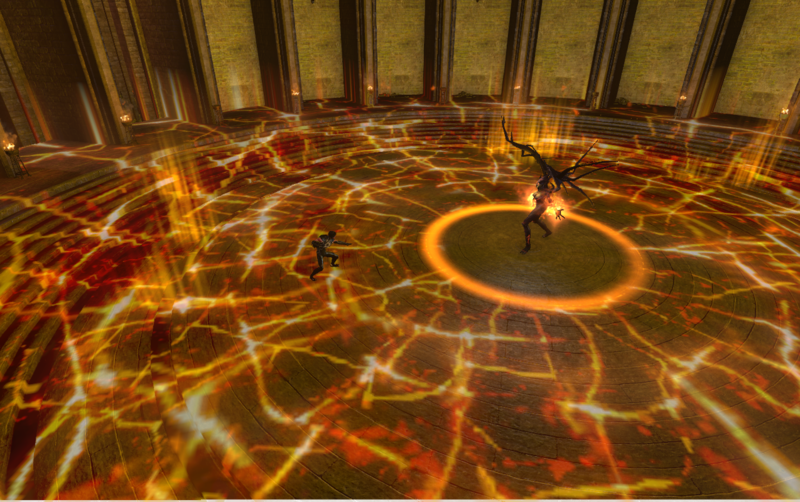 Recursia shields herself, summoning the magic-tortured Triggerthings to her aid. A powerful succubus sorceress fights both with vicious magics and with a summoned horde of magically altered rakshasas, who seek nothing more than to unite with her in an explosive union. A deadly Arcane Halo forces players close. Players should focus on killing Recursia as quickly as possible; delay will spell certain doom. A Triggerthing reaches its mistress, and explodes. This design began with Recursia summoning mirror images of herself around the outside of the room. The effect was fantastic, but the sequence lacked pressure. As the succubi are the natural controllers of the rakshasas, it was logical that Recursia would have her own special breed, overcharged with her deadly sorceries; and so the explosive Triggerthings were born. While fighting Recursia, players move in and out in a pattern, first clustering to avoid her explosion, then spreading to mitigate her chain lightning. The first two Triggerthing phases teach the behavior of the monsters under only moderate pressure; the final phase turns the encounter on its head, ending in a terrifying time-sensitive ‘dps race’ as monsters close in on every side. 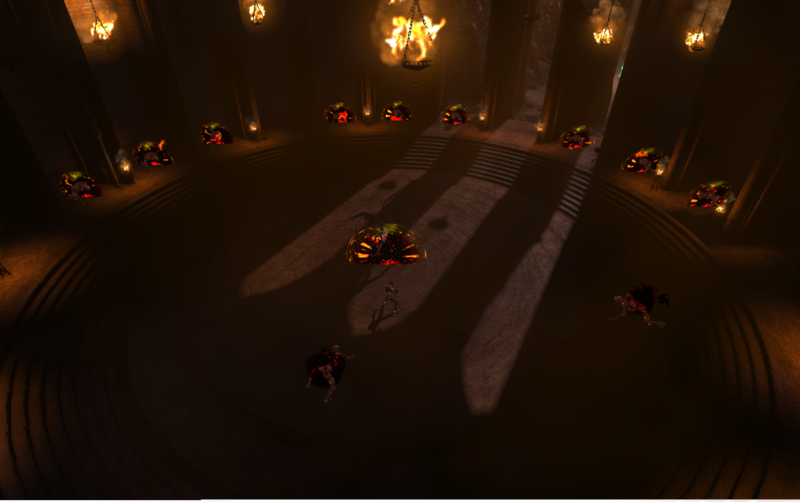 Two previous encounters set up the concept of dps races, and this is the ultimate conclusion of the concept in the normal mode of Hell Raised.